We all have a collection of digital photos that were taken without the best lighting conditions. Whether your picture was taken indoors or towards the sun, the problem is fixable. Adjusting the brightness will help lighten your picture. However, when you adjust the brightness it also means you will most likely need to adjust the contrast as well. This quick tutorial will show you how you can quickly adjust the brightness and the contrast to your favorite digital photos. I am using Pixlr, which is a free photo editing software. 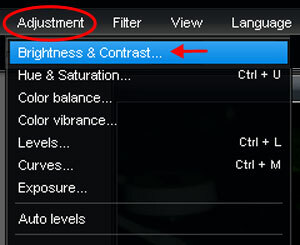 First, go to the top toolbar & find the adjustment section. Click on that & a drop down menu will appear, select the top option, "Brightness & Contrast". It's important to understand how the brightness and contrast adjustment works. The brightness setting will make all the bright spots in the photo brighter, and the contrast setting will darken all the dark areas. So you will need to work with the settings until you find the right balance between your light & dark areas. Once you have selected the Brightness & Contrast adjustment a gray box will appear. It will have two sliding bar where you can adjust the brightness and contrast separately. When you move the bar to the right it will increase the setting, when you move the bar to the left it will decrease the setting. For example, if I move the brightness bar to the right, I will add brightness, meaning my photo will become brighter. If I also move the contrast bar to the right I will add contrast which will make my photo darker. Move it to the left and it will do the opposite. The trick with the Brightness and Contrast adjustments is finding the right balance between the two. When you increase the brightness you will also want to play with the contrast. As you can see in this photo, I have moved my brightness to 12 and my contrast to 22. This allowed me to brighten the lighter areas of my photo and darken the darker areas. Now, if you drag the brightness bar to the far right without adjusting your contrast, you will wash out your photo. Yes, you can see more details, but the areas that should be dark are too light and it just makes the photo look flat and lifeless. Now, if you have a photo where you want to add contrast, if you go too far without adding any brightness you will darken the areas that should be bright and it will leave you will lose all your sharp details in the photo.